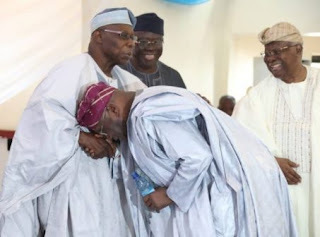 The doubts of many were doused on Wednesday at the Lagos Island Club Business Luncheon, when People's Democratic Party (PDP) presidential candidate, Atiku Abubarka was spotted bowing for former head of state, Gen. Olusegun Obasanjo Rtd. The former president Olusegun Obasanjo is known to love attention and believes people should worship him like a god. 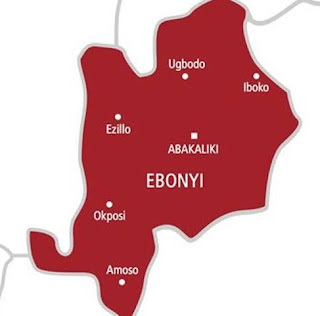 Perhaps, his premonition of a deity is what prompted his people in Owu town Abeokuta, to call him Ebora Owu (spirit of Owu town). And like a spirit he demands total obedience, irrespective of whether he is wrong or right. Abubakar Atiku, gunning for the presidency as the candidate of the PDP in the February 16 election, realised the task cant be achieved without the support of baba as he is fondly called. To this end, Atiku had to stoop for his former boss, Olusegun Obasanjo at the Lagos Island Club Business Luncheon on Wednesday to realise his presidential ambition. No wonder Obasanjo has thrown his weight around Atiku.